The film opens with images of old coin operated games, while a creepy mechanical sailor laughs; slowly we are introduced to three characters. Pinball Wizard (Geoff Harvey), a man with a vast collection and a vast knowledge of pinball machines; Defender (Stephen Highfield), a man obsessed with playing Defender and expounding upon its intricacies; and Edwardian Dreams (Tommy Hogan), a shirtless rockabilly with tattoos matching his favorite pinball machine. 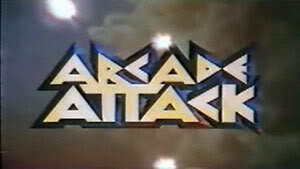 The film alternates between showing various pinball machines and classic videos games. Eventually this conflict between the proponents of both types of games spills out into animated mayhem as characters from pinball machines do battle with hordes of space invaders throughout the city. Even watching an older VHS copy of this film, all the machines are lovingly photographed. You really get a sense of the craftsmanship that goes into making a pinball cabinet as well as the elegant simplicity and frantic action of older video games. The characters are fleshed out in simple strokes, although some of the dialog feels a bit dated. The animation is the real draw here, it is vibrant and beautiful. The battle feels pitched and exciting but with plenty of humorous moments. As a kid of course I rooted for the invaders, but in watching it recently, I realized the film instilled in me a true love for pinball. Defender remarks that he doesn’t really like pinball because it’s just the player versus the laws of nature, there’s no mind to test you. I think that’s what draws me to pinball, there’s a pureness there that rarely occurs in manufactured experiences like video games and film. It’s a brilliant, fun film and an excellent look at game culture in its infancy. The animation is lovely to behold. Highly recommended and available on Youtube.